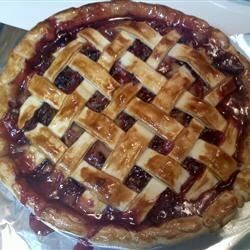 "After experimenting with many different fruit and rhubarb combinations, I have found this one to be my favorite. It is simply the most delicious pie I've ever had." Preheat an oven to 425 degrees F (220 degrees C). Line a baking sheet with aluminum foil and place on lower oven rack. Toss the rhubarb and blueberries in a bowl with the salt, nutmeg, lemon juice, 1 1/3 cup sugar, and flour until evenly mixed. Pour into the pie shell and dot with butter. Cover the filled crust with the top crust and flute the edges. Cut a few decorative steam vents in the top crust. Sprinkle the crust with 1 tablespoon of sugar; cover the fluted edges with aluminum foil to prevent excessive browning. Bake in the preheated oven on the baking sheet for 15 minutes; reduce the heat to 350 degrees F (175 degrees C) and bake 35 minutes longer. Remove the foil and continue baking until the crust is golden and juice is bubbling through the slits, about 15 minutes more. Cool completely before serving. Great combination of my two favorite fruits in a whole wheat pie crust! This is delicious! Delicious recipe!!! I adapted a little because I only had 2 cups of rhubarb. I also used 1/4 tsp of nutmeg instead of 1/8, and I also added 1/4 tsp of cinnamon. This was easy and very good! I made it for a family get-together and it was gone in under 5 minutes! I served it with a side of whip cream and it was fantastic! Perfect recipe! I used fresh blueberries and frozen rhubarb and took the suggestion to add 1/8c of tapioca to the filling. Worked perfectly! My favorite pie!